Offer an educational component through professional adjudication. Theatre BC’s Annual Provincial One Act Festival is open to any productions by community, student and emerging professional theatre enthusiasts. Up to 18 productions will be selected through an application process. The Festival will be held in a different BC location each year. Each selected production will be scheduled for a minimum two performances and will receive 50% of the gate to help offset their expenses. 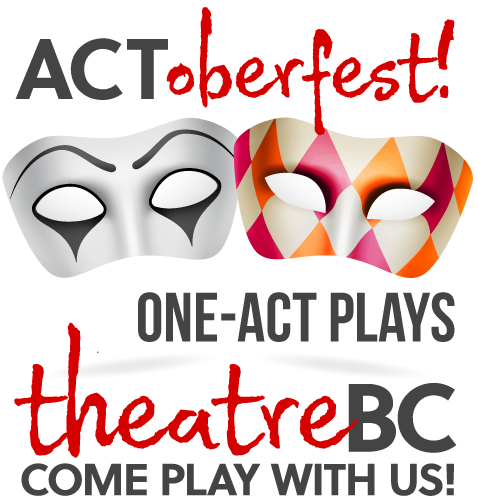 In keeping with Theatre BC’s mandate to foster the development of theatre, ACToberfest includes a general adjudication for all shows to provide some constructive feedback and skills development. The event also includes an awards luncheon with awards selections for acting, directing and best production categories. ACToberfest is currently a three-day event, running Friday to Sunday. The inaugural event was held in Kelowna October 12 – 14, 2007. Subsequent ACToberfest festivals were held in Prince George, October 17 – 19, 2008, and Creston, October 1 – 4, 2009. Encourages, but not limited toi, new Canadian plays and original works. Opportunity to bring a provincial-level theatre festival to smaller communities around the province. Application to host is open to any community—the intent is that this event could be hosted anywhere in BC, with venues created in banquet rooms, halls, galleries, classrooms and any assembly-use venues. Extremely positive response from those in attendance (participants and audience) at the 2007, 2008 and 2009 ACToberfest festivals bodes well for relatively quick growth and continued success. Good sponsorship support from host communities.